FREE Mainland UK Delivery (Exc. Scottish Highlands) on your Woodburner, Stove or Range-Cooker spares orders over £100. At Rangemoors we appreciate just how important your stove and range-cooker can be in your daily life. That’s why if you place your stove and cooker spares order with us before noon on a weekday and the order is in stock, then we will endeavour to dispatch the same day. Exceptions to Same Day Dispatch are Bank / Public Holidays, Weekends and during exceptionally busy periods (Autumn / Winter). In these instances, the parcel will leave the following working day. All mainland UK parcels (Excluding Scottish Highlands) leave here on a next working day service effected by DPD. Where a mobile number has been provided, the courier will normally send an SMS text message the morning of delivery with an estimated hour time slot for delivery. If this is not convenient the message will allow you to make alternative arrangements to suit your requirements. There is also an opportunity at the checkout to add a note for the delivery driver. Exceptions to Next Day Delivery are Bank / Public Holidays, Weekends and external circumstances beyond our control such as breakdowns, extreme weather etc. If you require a weekend delivery, please contact us for a quotation. Further delivery details are outlined below. Where an item is suitable to go via post, the item will be sent via Royal Mail. Standard delivery times apply. We cannot accommodate special requests for orders sent via post. What happens if my order is out of stock? Due to the high turnover of stock, we are unable to display live stock levels. Therefore, If your order is urgent, please check stock availability prior to ordering by calling us on 01837 680068. Orders that are not in stock will be notified by email. We endeavour to keep any waiting times to a minimum, but any delay will vary according to manufacturer and time of year. In some instances, this can take up to 28 days or in very rare cases longer. Delays occurring with suppliers/importers are beyond our control. Rest assured, once the stock arrives the turn around here is very quick. Shipping and handling charges are based on order weight and delivery destination. These charges cover the handling and processing of the order/payment, packing materials, and the cost of delivery. This charge will be shown at the checkout before any payment details are required. Below is a guide to our typical Shipping and handling charges. Orders over 24kg will be charged at a higher rate. 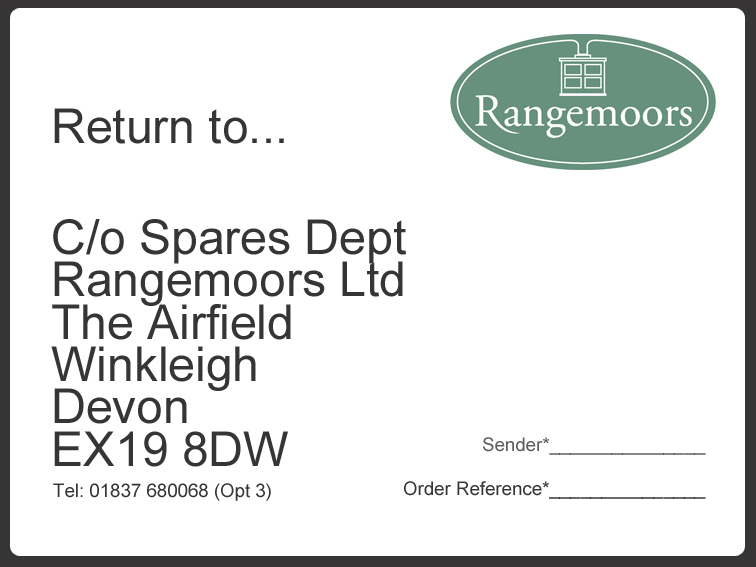 At Rangemoors we are pleased to offer our customers over 2,500 first line spare parts available from stock and many more available to order from our wide range of suppliers. We have daily courier collections, so if your order is in stock we will always aim to despatch within 24 hours (excluding weekends and public holidays) or same day if ordered before noon. You will receive an automated email to confirm when your parcel has been dispatched. In the event one or more parts have to be ordered in for you, you will be notified by email. We endeavour to keep any waiting times to a minimum, but any delay will vary according to manufacturer and time of year. In some instances this can take up to 28 days. Once the order is complete, you will be notified by email, and the goods dispatched in full. Only in exceptional circumstances will we part ship orders. Below is a list of the current destinations we are able to ship to. Upon receipt of your despatch confirmation email, please allow the following delivery times. To avoid delays, please ensure your address details are accurate and the shipping destination correctly selected. Orders with an incorrect shipping destination, entered to obtain cheaper shipping rates, will not be dispatched until further payment is made. We regret that we cannot deliver to PO boxes or Boats, neither can we currently ship parts to the USA, unless they can fit in a small padded envelope. Price on application. During the checkout process, we can offer different delivery options to suit your requirements. There is an option for a separate delivery address to that of the billing address. For orders sent via courier only, we are able to offer a service whereby notes can be made for the driver. Eg Parcel can be left in the garden shed. Where specific notes are made for the courier, this is done so entirely at the customer’s risk. We cannot accept liability for any loss arising as a result of this, however, caused. Finally, we are not currently able to accommodate specific dates or times for delivery, however, if a mobile number is supplied, the courier will normally send an SMS text with an estimated delivery time. A tracking number can also be provided upon request. We want you to be happy with your purchase but if you’re not, please contact us. Your right to return or cancel products does not apply to goods that are made to measure or are made to your specification, that have been clearly personalised or which by reason of their nature cannot be returned or are liable to deteriorate or expire rapidly. This doesn’t affect your statutory rights if goods are faulty or not as described. You can cancel by email, phone call or write to us. We may make a deduction from the reimbursement for loss in value of any goods supplied if the loss is the result of unnecessary handling by you. We will make the reimbursement no later than 14 days after the day we receive back from you any goods supplied. Please check your delivery carefully upon receipt. In the unlikely event of any damages or shortages, you must notify us within 3 working days. Regrettably claims made after this period will not be accepted. We will request images of the damaged goods (sent via email) for insurance purposes. Only once we have received any images will we then send out replacement goods. Finally, we would request that you retain the damaged items for 21 days, as in some cases we may wish to collect them.